It’s been a long time my friends! But I’m hoping that blogging is like riding a bike and I’ll fall back easily into a routine of recipe writing and posting. We’re getting closer and closer to the start of the CSA box season and starting to get a taste of what’s to come at the Farmer’s Markets that are now open. In anticipation of the boxes, I want to take this opportunity to review how to open and properly break down a CSA box. These workhorses can take a lot of wear and tear and, if properly cared for, can last the whole season – which saves the farms money and keeps the boxes out of landfills for as long as possible. To see it in action, Angelic Organics produced this great video that walks you through step-by-step how to open and break down a CSA box. A tip if you’re new to CSA boxes: part of the reason they hold up so well is a coating of wax on the inside AND outside of the box. So be careful if you’re wearing your favorite little black sundress or concert t-shirt – otherwise you can end up with a white smudge across the front of your clothes! This year I will also be reporting for The Local Beet: Chicago blog. If you haven’t visited the Local Beet yet, it’s an awesome resource for anyone interested in local food and especially for CSA shareholders. I’m looking forward to cooking, blogging and working my way through 24 boxes with you this season. Stay tuned! 24 boxes is a weblog devoted to seasonal cooking with fresh, local vegetables from Angelic Organics. 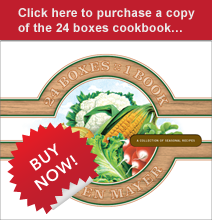 Click here to purchase the 24 boxes cookbook – a collection of seasonal recipes from the blog, each focusing on a week during the box season plus a few extras for good measure! Spiral bound, full color photography, printed in the USA and hand-assembled in Chicago, Illinois. Beautiful AND usable!